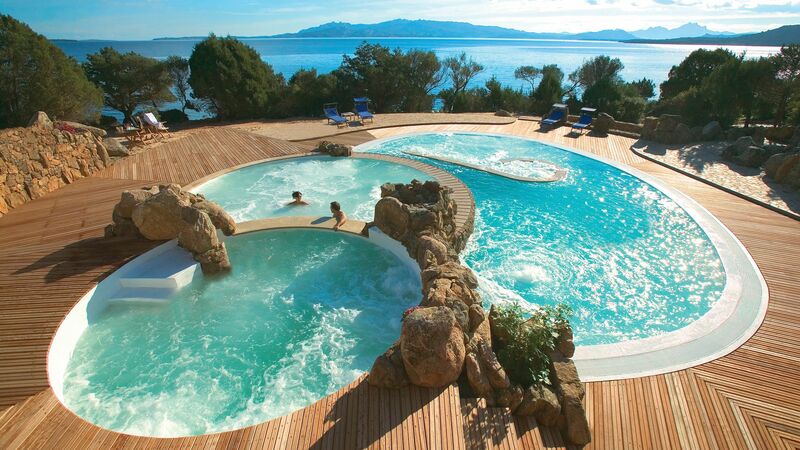 Palau holidays take you to a pristine seaside town on the north coast of Italy’s Sardinia. It’s close to the beautiful Maddalena islands where you’ll find untouched natural surroundings and fantastic beaches to explore. Couples will love the laid back atmosphere of the town, with the chance to explore further by boat, on foot or along the mountain biking trails. When it comes to relaxing you’ll find plenty of beaches along Sardinia’s north coast. With white sands and rugged backdrops most of the stretches remain fairly wild, with the chance to find your own little spot and spend the day soaking up the sun or watching little ones paddle in the crystal clear waters. Beside Palau’s harbour is the perfect beach for those wanting to snorkel, while just 10 minutes down the road you’ll find big waves popular with surfers and sailors alike. Luxury holidays in Palau centre around its rugged beaches and spectacular landscapes. Spend the day in the pretty town, taking in the whitewashed buildings and warm stone architecture and making your way down to the port for exquisite seafood dishes. Take boat trips across to the deserted Maddalena islands where you can explore quiet lagoons and stretches of sand where your footprints will be the only ones in sight. When it comes to luxury holidays in Palau, look no further than Sovereign. We’ll help you find the best hotel in the area, with our expert Trusted Advisers on hand to offer advice and expertise so you can relax, knowing everything is taken care of. Stay at the Capo d’Orso Thalasso & Spa for spectacular views from its pretty terraces and a chance to immerse yourself in the area’s beautiful natural surroundings. There’s also a Thalasso spa which focuses on saltwater treatments which will leave you feeling fully relaxed. The Strait of Bonifacio sweeps out in front of Palau, leaving over 60 granite islands and 300-plus beaches in its wake. This is the Archipelago di La Maddalena National Park – one of the reasons why many people head to Sardinia in the first place. The main island, La Maddalena, is a good place to start. Isola Giardinelli, on the east coast, pairs threads of white-gold sand with wind-hollowed rock formations. And as with many of the Maddalena Islands, the waters are so clear you can see every fish and anemone swaying on the seabed below. Transfer time from Olbia airport to Palau is approximately 40 minutes.